As the iPad ecosystem expands and matures, it becomes easier to leave your laptop behind and accomplish much of your business work on Apple’s tablet computer. If you only need to view Microsoft Excel files, you don’t need extra software, because iOS natively displays .xls and .xlsx files. Several fine tools also exist for creating and editing even large and moderately complex spreadsheets on an iPad, but because no iPad version of Excel exists, you may have to jump through a few extra hoops, give up some functionality, or both. If you intend to create or edit a spreadsheet on your iPad and then move it back to your Mac (or a PC), you must contend with the iPad’s awkward array of file-transfer options. Some apps let you copy documents to and from your iPad using iTunes, but this requires a wired connection, which isn’t always convenient. E-mailing attachments is wireless, but only marginally less cumbersome. You can use a file-transfer app such as MobileMe iDisk, Dropbox, or SugarSync to copy your spreadsheets via the cloud, and then tap the app’s Open In button to send it to an app that can edit it. But it turns out that most of the apps that can edit spreadsheets also have a built-in way to access Dropbox, making the service a good storage spot for files you want to edit in multiple locations. Unfortunately, none of the apps that can edit spreadsheets on an iPad supports all the features of Excel or Numbers on Mac OS X (not even Numbers for the iPad). At minimum, you can expect to lose some formatting (such as fonts that aren’t available on your iPad) when you import the files. If you use only common formulas, all the math should continue to work, but depending on which app you choose, charts, graphics, and certain advanced features may not come through. What’s worse, in most cases (except with Quickoffice Connect Mobile Suite and Documents To Go, as I explain in a moment), after you edit the spreadsheets on your iPad and reopen them on your Mac, all those items stripped out during import will still be gone. So if it’s essential to you that every last element of your spreadsheets survives the round trip, be sure to choose an iPad app that makes that possible. Numbers Apple’s $10 Numbers for the iPad app ( ) can import documents in Excel or Numbers for Mac formats and offers the widest range of spreadsheet features of any iPad app, including input forms and lovely (2D) charts. Numbers can’t simply open an existing spreadsheet and save it in place; incoming files must be imported, and outgoing files exported (and then transferred to another location). A service called DropDAV makes this process simpler by letting Numbers connect to your Dropbox account via WebDAV. The service costs $5 per month. In Numbers for the iPad, you can use a full-size numeric keypad plus other handy keys for entering data quickly. Quickoffice Connect Mobile Suite and Documents To Go These two apps share an important feature: unlike Numbers, they can open, edit, and save an Excel spreadsheet without stripping out any data or formatting, even though they can’t display or edit all the existing information; spreadsheets can make the round trip from Mac to iPad and back safely, without losing anything. This could be a crucial capability for those working with spreadsheets on multiple platforms, especially if they were created by other people. Quickoffice’s $10 Quickoffice Connect Mobile Suite for iPad ( ) is especially finger-friendly, thanks to a large default font size and handles that make it easy to select a range of cells and change that selection at any time. DataViz’s $10 Documents To Go ( ) uses a smaller default font and a more efficient layout that fits more information on the screen, but is slightly less convenient to work with. For example, you can double-tap-and-drag to select a range of cells, but you can’t modify the selected range without starting over. Still, both apps are solid, competent spreadsheet editors. Quickoffice Connect Mobile Suite is an especially touch-friendly spreadsheet editor. For example, it features handles that let you extend selections easily. Sheet2 HD and Office2 HD Byte2’s $6 Sheet2 HD and $8 Office2 HD ( ) office suite include spreadsheet editing capabilities. (Office2 HD also lets you edit Word and PowerPoint files.) These two apps both save most, but not all, features of an original Excel document when you save a spreadsheet. Charts, however, don’t make the cut. Mariner Calc Mariner Software’s $6 Mariner Calc for iPad has a full complement of basic spreadsheet functions. It can read and write Excel files (.xls only, not .xlsx), but lacks charts and forms. Transferring files to and from your Mac requires that you use its built-in Web server, which is wireless but still more awkward than going through Dropbox or other cloud-based services. 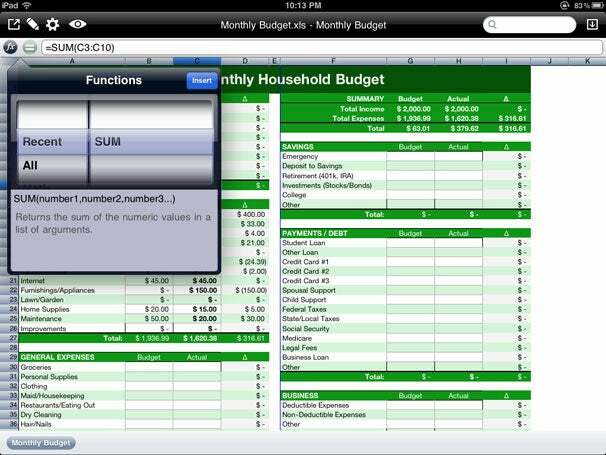 Mariner Calc for the iPad offers a full selection of standard spreadsheet capabilities. Google Spreadsheets Google Spreadsheets, the spreadsheet component of Google Docs, can import and export Excel files (with some loss of formatting and other features). However, using this Web application in Safari on your iPad is unsatisfying. By default, spreadsheets open in list view, which lets you modify values, add rows, and change sort order, but not add or reorder columns, edit formulas or styles, or add graphical elements. If you tap the Go To Spreadsheet View link at the bottom, Google shows you the version of the file you’d see in a Mac browser, but because the interface was designed to be manipulated with a mouse, on your iPad you’ll find it tricky to select a range of cells, resize columns or rows, and do other tasks that involve dragging. You can, however, bypass Safari and open Google Spreadsheets documents directly in a number of native iPad apps, including Documents To Go, Quickoffice Connect Mobile Suite, Sheet2 HD, and Office2 HD. Smartsheet The new Web-based Smartsheet service (still in beta) gives you spreadsheets of a sort, and although its focus is more on list and project management than on conventional numerical data and associated calculations, it can import and export Excel files and Google Spreadsheets. Pricing ranges from $10 to $149 per month depending on features and the number of creators.